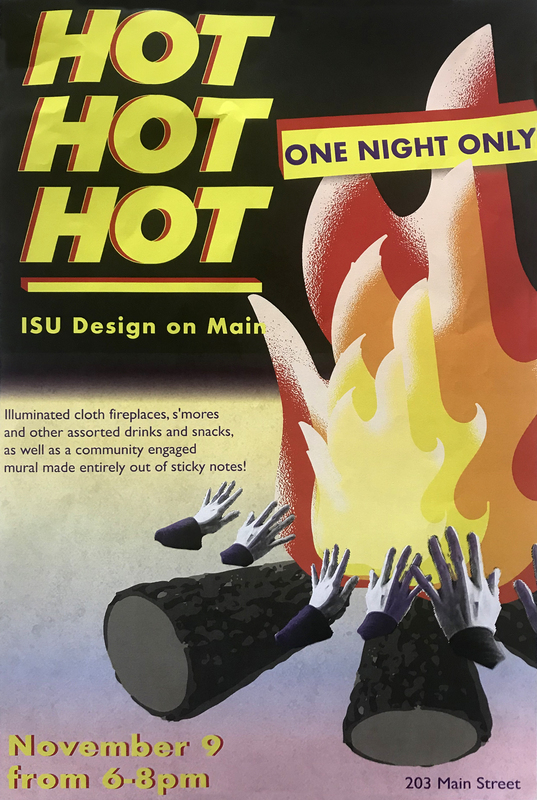 AMES, Iowa — The Iowa State University Design on Main Gallery will host a one-night community celebration from 6 to 8 p.m. Friday, Nov. 9, at 203 Main St. in downtown Ames. “HOT HOT HOT” will feature illuminated cloth fireplaces, s’mores and other snacks and beverages. Members of the Ames and Iowa State communities are invited to create a collaborative mural entirely out of sticky notes during the event. Design on Main is a satellite studio and gallery facility that connects the ISU College of Design with the greater Ames community. The gallery’s mission is to strengthen creative connections between Iowa State and the Ames community through arts education, artist-led projects and events geared toward community interaction. All events are free and open to the public.